Jan is an experienced, engaging and informative speaker. She calls on her wealth of clinical experience and extensive research when addressing an audience on good health, great eating and living with vitality. ​Often quoted in Body&Soul magazine in the Sunday papers Jan is sought after for her contributions to many articles. Jan was the natural health contributor to Australian Good Taste magazine for 14 years. 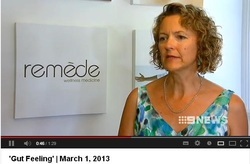 Jan has been called on by Channel Nine News Perth to offer comments on various health topics.